There is no longer any such thing as a stable, secure workplace. Technological change and the opening of markets to worldwide competition make it impossible for businesses to survive very long doing the same work in the same way. These changes in the ways firms do business frequently require more skills from workers than were needed in the past. Workers – those new to the workforce and those who have been in the workforce for many years – benefit from training and need to continually upgrade their skills. In an economy that is in transition, the American worker is also finding that investing in education and job-related skills provides the best opportunity for obtaining and keeping higher paying, long-term jobs. Current research shows that training is most effective when it takes place on the job or in a job-like setting and that the more training is linked to work, the better the result. Employer-provided training may also create more motivated trainees, more effective tutorial learning methods and more appropriate materials and equipment. Basic skills are often easier to learn when they are integrated into a training program that is specific to the context of a particular job. WORK TOGETHER: Management and workers must collaborate in establishing and operating workplace-based career development programs if they are to be successful. ASSESS THE CURRENT SITUATION: Employers and employees should start by carefully analyzing the status of the career development program in their company. What supports, barriers, incentives, and disincentives are there for employees to enhance their skills? MassHire Greater Brockton Career Center – MassHire GBCC is a one-stop information resource for employers and job seekers. Whether beginning a first job search, interested in career development, or making a mid-life career shift, the resources and information needed to be successful can be found at MassHire GBCC. They provide employers with access to an unmatched labor pool of skills and professional workers. MassHire GBCC offers a wide range of services, information, and other resources to help further employers recruitment initiatives and support their human resources effort. MassHire GBCC can broker training for companies by assessing needs and designing training strategies with the employer. Local community colleges – Provide technical assistance in assessing business skill needs, designing and offering responsive training programs, and counseling employees on their personal career plans. They can also help design customized curricula and arrange for training courses to be delivered at the employers worksite. Trade Associations – Many trade associations are engaged in projecting the future of their industries and analyzing future skill needs. This information can be extremely helpful in identifying and classifying business skill needs. Government agencies – The federal government and many state and local governments, actively support workforce development as a foundation for economic prosperity. Other non-profit organizations – They can serve as valuable resources for employers and employees in creating career development programs. Qualifying training initially preparing people for work. Skills improvement training for employed individuals who want further education and training to upgrade their skills and increase their job mobility. Retraining for those who have been or are about to be displaced from their jobs and need to prepare for a new line of work. Second-chance training-for individuals who need some combination of basic education and job skills, perhaps in combination with other social services, to reach economic self-sufficiency through employment. Training managers and supervisors as mentors to ease transition and foster continued success. The Workforce Training Fund provides resources to Massachusetts businesses and workers to train current and newly hired employees. The mission of the Workforce Training Fund is to provide applicants with resources to invest in the Massachusetts workforce and improve employee skills, and to maintain the economic strength and viability of the Commonwealths businesses. Massachusetts employers contribute approximately $18 million per year to the Workforce Training Fund. The Funds focus is on small to medium sized businesses that could not make this investment without the assistance of the fund. The Workforce Training Funds priorities are projects that will result in job retention, job growth, or increased wages; projects where training would make a difference in the company’s productivity, competitiveness, and ability to do business in Massachusetts; and projects where the applicant has made a commitment to provide significant private investments in training during and after the duration of the grant. Training grants are direct grants awarded to employers, employer organizations, labor organizations and training providers to train current and newly hired workers, ranging from $2,000 to $250,000. The duration of these grants may be up to 24 months. Technical assistance grants, ranging from $5,000 to $25,000, help an employer or a group of employers or employees to determine a set of training needs. The duration of a technical assistance grant may be up to six months. The budget funds requested must cover current or newly incurred costs directly related to training. Budget requests must be matched dollar for dollar, and may include cash or in-kind contributions. For general assistance in identifying trainers and preparing the application contact the Workforce Training Fund staff at the Massachusetts Division of Employment and Training at 1- (800) 252-1591 or visit www.detma.org or contact the Brockton Area Workforce Investment Board at (508) 584-3234. The Massachusetts Department of Education offers Workplace Education grants to support the development of a strong connection between the business/strategic plan of a business and the education and training needs of its workforce. Priority is given to small and mid-size businesses with fewer than 150 employees. Applicants are asked to provide evidence that the employees they wish to train lack basic foundation skills in English, reading, writing, speaking, and math. For more information, please contact the Department of Education at (781) 338-3000. 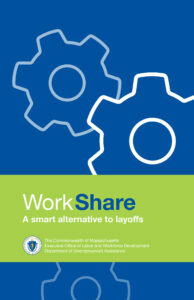 The Commonwealth Corporation, a quasi-public organization responsible for a wide range of public and privately funded initiatives designed to meet the labor needs of businesses, oversees the Mass High-Tech Entry Ramp program. The program is designed to: 1) help alleviate the shortage of skilled workers in high-tech occupations in Massachusetts; 2) train individuals for high-tech occupations which will increase their skill; and 3) promote partnerships between businesses, educational institutions, and intermediary organizations to develop industry-driven training programs. Apprenticeship programs stimulate and assist industry in developing and improving apprenticeship and other training programs designed to provide skilled workers to compete in a global economy. Apprenticeship is a combination of on-the-job training and related classroom instruction in which workers learn the practical and theoretical aspects of a highly skilled occupation. The U.S. Department of Labors Bureau of Apprenticeship and Training is responsible for registering apprenticeship programs. Individual employers or an association of employers, with or without the participation of labor unions, may apply to run apprenticeship programs. Prospective employers work with the Bureau of Apprenticeship and Training field representatives to develop a set of apprenticeship training standards that include an on-the-job training outline, related classroom instruction curriculum, and the apprenticeship program operating procedures. The program becomes registered if it meets Federal requirements. For more information, contact Division of Apprentice Training, Department of Labor and Workforce Development, 399 Washington Street, 4th Floor, Boston, MA 02108, (617) 626-5400. Many otherwise-able workers cant succeed because English isn’t their native language and their English skills are basic or non-existent. For some, English language skills open the door to job success. If you have employees experiencing difficulties with the English language or other basic skills, the following institutions offer free classes in basic education, adult high school diploma, GED or English for speakers of other languages. ALX helps employers improve workforce productivity. Find the training and education resources to make your company more competitive in the global economy of the 21st century. Once you enter the website, click on the Employers button for training and educations resources that fit the unique needs of your company’s workforce. The National Alliance of Business is the ONLY NATIONAL, NONPROFIT, BUSINESS LED ORGANIZATION FOCUSED SOLELY ON HUMAN RESOURCE ISSUES. The Alliances strength lies in its unique ability to bring together business and government, management and labor, education and commerce to address common workforce needs. As you click on the Workforce Development button, you will find information on the Business Coalitions, Learning and Training, Workforce Investment Act and Welfare Reform, among others. Established to coordinate projects that are classifying skills and developing national skill standards for American industries. NSSB can provide industry-specific information to help employers plan skill development programs necessary for hiring, training and retaining their workforce. Once you enter the website, you can click on Related Links to access specific information on assessment and training, education, and other skill standards related sites. Provides high quality job training, employment, labor market information, and income maintenance services primarily through State and local workforce development systems. Once you enter the website, click on For Employers and For the Employment/Training Community for the current services available.